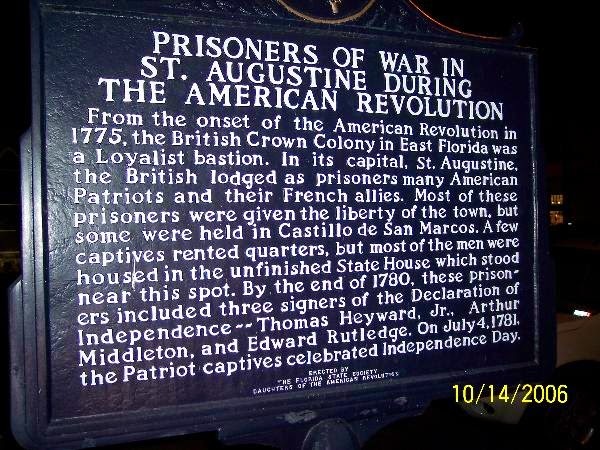 What three American Patriots did FX Sanchez help to survive the prison in Castillo de San Marcos? of Saint Helena Parish, South Carolina, 7/28/1746 - 3/6/1809. He was a lawyer and a plantation owner, who was married twice and fathered eight children before he died at the age of 62.
of Charleston, South Carolina, 6/26/1742 - 1/1/1787. He was a plantation owner who was married once and fathered nine children before he died at the age of 44.
of Christ Church Parish, South Carolina, 11/23/1749 - 1/23/1800. He was a lawyer and a plantation owner who married twice and fathered three children before he died at the age of 50.